Palestinian political and economic analysts and observers are leery of Israel’s five-year plan worth two billion shekels to fund education and transportation in East Jerusalem, since simultaneously it decided to demolish Khan Al-Ahmar in southeast Jerusalem and displace the Bedouin residents there. They say it shows that pumping funds into East Jerusalem may not in actuality benefit Jerusalem residents. Rather, it serves Israel’s plot to take control of East Jerusalem and declare a united Jerusalem while annexing settlements to the city, which explains the ferocious attack on Khan Al-Ahmar and Bedouin clusters. The occupation state said it earmarked a large budget to encourage schools to adopt Israeli curricula and send Palestinian students to Hebrew universities through scholarships for hundreds of students, as well as opening job centres and industrial zones for Jerusalem residents, to take advantage of their economic need and undermine their resistance. Adnan Abu Amer, a political analyst, said Israelis have a clear vision of separating the West Bank and Jerusalem as they pursue making Jerusalem a purely Jewish capital while waiting for the right time to declare the city united and the capital of the Jewish state. Abu Amer believes the current steps pave the way for this through measures on the ground such as evacuating Khan Al-Ahmar and annexing settlements in Jerusalem to Israel. Also, increasing Jewish presence, raising Arnona (municipal) taxes, and other measures in order to impose Jewish presence in Occupied Jerusalem, while sometimes resorting to financial and administrative incentives. Abu Amer warned of the critical nature of the situation, and that the West Bank is also under threat since currently there are preparations to unofficially and gradually dissolve the Palestinian Authority (PA) and convert the West Bank into small cantons and isolated areas. Eventually, they can be linked to Jordan as part of a confederate. This is what Israel wants in the long run. He noted that Israelis are handling occupied Palestinian territories in Jerusalem and the West Bank as if the PA does not exist by increasing Israeli civil administration mandates, and communicating directly with Palestinian residents and not the Palestinian Ministry of Civil Affairs to issue travel, visit and work permits through the Coordinator of Government Operations in the West Bank. This confirms these are steps to abolish the PA and return to pre-1994 arrangements before the PA was created, which would bury the Oslo Accords. Economic analyst Nasr Abdel-Kerim believes Israel’s economic plans in Jerusalem are compatible with its political plot after US President Donald Trump recognised Jerusalem as the capital of Israel. Israel and the US now view the city as the political and administrative capital of the Zionist entity, which explains events in Khan Al-Ahmar because Israel is moving quickly to impose a settlement that may or may not be compatible with Trump’s vision. What is certain is that conditions right now are ripe for imposing realities on the ground, which Israeli Prime Minister Binyamin Netanyahu believes will facilitate imposing a settlement. Abdel-Kerim believes Jerusalem residents, as well as the Arab world, will pay the price and that Jerusalem dwellers will not benefit from the economic development of East Jerusalem and merging it with Israel because there is a siege to isolate them from their natural surroundings in the West Bank as part of collective punishment policies, including a clampdown on construction, freedom of trade and taxation. He continued that Netanyahu’s vision is based on what is known as economic peace, and Netanyahu is currently focused on cementing facts on the ground, which is expected to lead to a settlement at the expense of the Palestinians. Abdel-Kerim also sees the future as dim, although anything is still possible, noting that everyone is currently focused on the humanitarian crisis in Gaza, not on liberating Jerusalem economically. He explained that although Gaza’s troubles appear economic on the outside, at the core is a political problem: the goal to separate it from the West Bank to annul the Palestinian national project. That does not negate difficult humanitarian conditions in the Gaza Strip. As the Jerusalem street struggles to react to Tel Aviv’s decision to pump unprecedented budgets into East Jerusalem, and prevalent concerns that Israel is close to concluding the Jerusalem issue and creating the new Jewish capital in all of the Holy City, the Palestinian government said it has taken clear steps and earmarked monies to confront Israel’s moves that drain the resistance of Jerusalem residents and abort future solutions – especially since 40 per cent of planned budgets aim to cut links with territories surrounding Jerusalem while linking settlements under the pretext of developing transportation. Youssef Al-Mahmoud, spokesman for the Palestinian cabinet, said the plan has the aim of swallowing the city of Jerusalem, cautioning about the need for Arab and Islamic nations to be alert. The Ministry of Occupied Jerusalem Affairs also warned against the plan because it gives incentives to Jerusalem residents with false services while imposing a Talmudic narrative in the Old City. The National Bureau for the Defence of Land and Settlement Resistance, affiliated with the Palestine Liberation Organisation (PLO), said that yet another ethnic cleansing crime was committed by the occupation last week by attempting to obliterate Khan Al-Ahmar village. The operation aimed to uproot, displace and ethnically cleanse to serve settlement goals. The bureau’s weekly report revealed that Khan Al-Ahmar residents and their supporters stood up to the ethnic cleansing plot aimed at connecting the settlements of Maale Adumim and Kfar Adumim in Occupied Jerusalem, and expanding the city’s borders at the expense of the Palestinians. 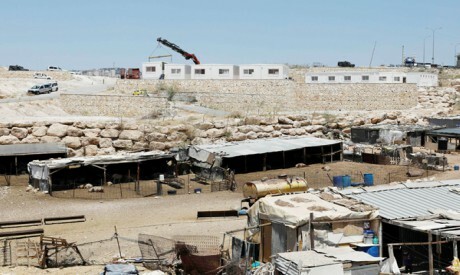 The report added that forced displacement separates the north and centre of the West Bank from the south, will connect Maale Adumim with West Jerusalem and close the eastern area and connect it to settlements surrounding Jerusalem. This requires expelling and displacing all Bedouin communities in the area, and replacing them with 100,000 settlers. The plan was born in 1994 under Yitzhak Rabin and was approved in 1997 during Netanyahu’s first tenure as premier when Yitzhak Mordechai was defense minister. Khan Al-Ahmar is located in the target area. Fifty-three per cent of its residents are children, and 95 per cent are refugees registered with UNRWA. They belong to the Bedouin Al-Jahaleen tribe that the Israeli army expelled from southern Palestine in the 1950s. The occupation is plotting to displace Khan Al-Ahmar residents and other Bedouin clusters and transport them to areas close to a garbage dump east of Abu Dees. The occupation believes it is important to remove the Bedouins from this area because it is close to Street 1 and settlements that can be linked to Jerusalem. The report concluded that threats are still imminent. The occupation government deals with Area-C in the West Bank (based on the Oslo Accords) as a vital venue to build settlements. By demolishing Khan Al-Ahmar it is preparing for the construction of the largest airport in Bani Moussa, a string of hotels, roads, railways and industrial and trade zones. By criminal displacement of Palestinians in this area it aims to accomplish what is known as “Greater Jerusalem”. Evacuating Bedouin communities and annexing Maale Adumim to Jerusalem is the first phase of the “E1” plot to disconnect the north and south West Bank. Later, settlements to the north, such as Givat Zeef and Gush Etzion south of Bethlehem, would be annexed to the Holy City.